Homeowners who don’t keep plunger ready always find out the clogged toilet as a minor issue. 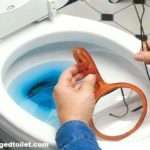 There is a good hack idea is represented in this content, which will predict the way of unclogging a toilet with home products rather than dangerous chemicals. We will discuss how to unclog a toilet with baking soda and vinegar. As we all know, both of them are known as natural cleaning ingredients as the mixture of those create an effective chemical reaction. Can you remember the volcano experiment? Yes, the one that we had learned in science classes. A mixture of baking soda and vinegar is effective for mimicking eruption. Because the mixture of both creates such a powerful reaction that creates a good amount of bubbles and assists in removing clogs. 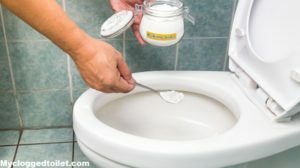 Is it really possible to unclog toilet safely with vinegar and baking soda? Have you ever tried to clean blocked sink with soda and vinegar? Combination of both ingredients creates an effective reaction that helps in unblocking sink as well as a toilet too. The only thing you have to know is a measurement of the amount while mixing those ingredients. Before solving any issue, you have to identify the intensity of that issue. Like that, you have to identify the severity of clog before cleaning it. Generally, people use an equal amount of baking soda and vinegar for making a mixture. If the condition of the clog isn’t too bad, you can use the full amount of baking soda with a little amount of vinegar. But in case of worst situation, use smaller amount in certain increments one after another. Be cautious while mixing the ingredients, because the wrong amount in the mixture can create overflow. Identify if you have a major or minor clogged issue. In case of serious one, scoop 1/4 to 1/2 cup of baking soda into the toilet bowl. In case of minor one, pour the whole amount you measured for this. If you can’t fix the amount to add, you can add vinegar equal to baking soda. I mean if you have added one cup of baking soda, add one cup of vinegar with it to the toilet bowl. Proper mixing will create a frizzy situation that will help to unclog. Wait a few moments for the bubbly reaction created by those ingredients, then move to next step. A half gallon of water will be enough for this. Vinegar, baking soda, and hot water do the best work just like a chemical product. Firstly boil the water then pour it into the toilet bowl after getting little cool. This will help to remove the dirty clog faster. Wait for hear the suction sound that will ensure that toilet is now clean. If still it is unclogged, repeat the whole procedure and after that flush it once or twice. 1. If you have used any chemical before, then don’t try this procedure after that. It may cause the harmful situation. 2. If it is still clogged, then call a plumber to fix the issue. Otherwise, you may have to fave overflow issue. 3. Try to use at least half gallon water. the little amount won’t works as it requires more to push the clogged item down. 4. After boiling, wait for few minutes to let the water be cool, more hot water may hamper your toilet bowl by cracking porcelain. 5. Try to use distilled white vinegar as the mixture of it frizzes easily. In case of unavailability of vinegar, try with dish soap. 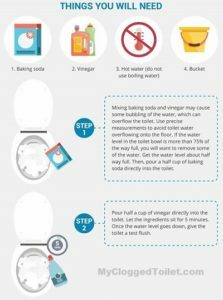 Note: If your toilet clogged with poop in it then check out this guide for more pieces of information. If the clogged item is a hard obstruction, this method won’t give any results. As there is no use of chemical reactions, you have to keep patience. Sometimes it may take a whole night to dissolve the clogs. When it will be dissolved, the water will flow smoothly and quickly and the water will drain completely. So here all the steps of how to unclog a toilet with baking soda are given. In cases of any query, you can ask further in the comments section.